June is National Homeownership month, and the perfect time to start your journey to becoming a homeowner. There are many benefits to owning your home. It helps promote stable neighborhoods, builds community pride and is still one of the best ways families can build wealth. 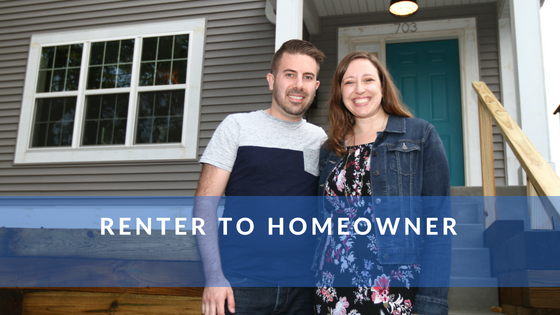 If you’re ready to make the transition from renter to homeowner, begin by working with a HUD certified housing counseling organization to get started with the home purchase process – they will determine if you’re ready or need to work on your credit. The City of Milwaukee will work with you when you’re ready to purchase one of our properties. The Castro family was able to bring vitality to a community by purchasing a home from the City of Milwaukee. Below you can continue reading more about the Castro family’s story, properties for sale, neighborhood events, learning opportunities, open houses, helpful resources, and other opportunities. Ricardo and Eneidia Castro purchased their three-bedroom home on December 18, 2017 with the help of ACTS Housing. The property was owned by the City of Milwaukee, and had been foreclosed upon for unpaid taxes. When you walk into the Castro home, nestled comfortably on Milwaukee’s South Side, you would have never guessed its prior distressed condition. Ricardo Sr., a chef at a Mexican restaurant, said that the family “repaired everything” including the kitchen and the bathroom. They marked their move-in date with a party. “We always thought about buying something like this,” Ricardo Sr. said. They received two grants with the help of ACTS to complete their rehab projects, and completed the “sweat quality” work themselves to lower home rehab costs. According to the couple’s son, Ricardo Jr., this often required late-night shifts, even after a full day’s work. The pride is palpable in the Castro home. No one is more proud than Ricardo Jr. of his parents. “There’s not a lot of opportunities to take on a project like this, and so for them to just go for it not rely on anyone else was great,” Ricardo Jr. said. If you are interested in becoming a homeowner, contact Take Root Milwaukee for a list of HUD approved homebuyer counseling agencies. This list includes ACTS Housing, the organization that helped the Castro family purchase this home. Homes for sale on the Extended Listing are available to owner-occupants and investors who want to earn rental income. Homes are also listed with external agents. Work with your realtor to find your new home in the city. 3 BR / 2 BA • 1,458 sq. ft. This beautiful single family home located in the Park West neighborhood is full of charm. It includes two lots at 2875 & 2877-27 N 22nd St for ample space to create a garden or just enjoy the green space. May be eligible for up to $20,000 forgivable loan. Designed by H. Messmer and Son this large Arts & Crafts style home was built in 1904. Set on a large lot in the Cold Spring Park Historic District this house has a new roof, gutters and rebuilt eaves. May be eligible for up to $20,000 forgivable loan and WI Historic Homeowner’s Tax Credits. 2 BD / 1 BA / each level • 2,340 sq. ft.
Make this lovely duplex at the west end of Historic McKinley Boulevard your home and have rental income to subsidize your investment. The Bernholz house sits on a tidy lot on a row of fine duplexes. This Queen Anne gem was built in 1907 and is ready for a full makeover. Exterior was completely renovated in 2016 and awaits a buyer to modernize the interior. The Department of City Development (DCD) has created the Housing Help Web Tool as a single resource for those looking for housing information and resources from various City departments. The Housing Help web tool filters information for three types of users: homeowners, home buyers and investors/non-profit organizations. Explore this new tool to find resources you can use! Residents can use MKE Mobile to locate, photograph and provide supporting information to ensure speedy resolution of issues. Issues that can be reported include Abandoned Vehicles, Graffiti, Litter, Potholes or other issues. You can download the app on your smartphone today. You must have a Google Play or Apple ID to download the app. Learn more about MKE Mobile. Tuesday, July 17, 6 – 7:30 p.m.
Monday, August 13, 6 – 7:30 p.m.
Thursday July 12, 10 – 11:00 a.m.
Hillside Family Resource Center, 1452 N. 7th St. In an effort to better equip the development community with understanding the permitting process in the City of Milwaukee, the Lunch & Learn Summer Series will explore current development opportunities and challenges. Mark your calendars to join us! Monday, July 23, 2018 - 12 p.m. - 1 p.m. Learn about City approval processes, timelines, special zoning regulations and how to work with various departments in the permitting process. To see the full list of upcoming workshops visit our Lunch & Learn website. Attend the next Department of Neighborhood Services FREE 5-hour training seminar and receive a 100-page manual and certificate of completion. Mitchell Street Library – Community Room, 906 W Historic Mitchell St.
Visit our Landlord Training website for more information on upcoming trainings. Saturday, June 16 11 a.m. - 5 p.m. The Historic Concordia Neighbors, Inc. 28th Annual Home Tour will include nine homes, architectural and gallery spaces, plein air artists at work and live performances. The tour starts at the Wgettha Building on the Potawatomi Campus at North 33rd Street and West Kilbourn Avenue on Milwaukee’s Near West Side. This is a ticketed event – you can learn more by visiting the Historic Concordia Neighbors, Inc website. This day you can tour one of our properties, 2833 W State St from 12 p.m. - 2 p.m. Open for all to view! Alderwoman Milele A. Coggs invites neighbors this Saturday, June 16 at 8 a.m. at N. 9th St and W. Ring for the We Got This work initiative where boys and teens could receive $20 for landscaping and gardening work, as well as for tackling neighborhood cleaning and other small projects. Alderman Russell W. Stamper, II invites neighbors to attend the Midtown Block Party and Community Picnic Saturday, June 16 from 11 a.m. to 4 p.m. The event will be held at Tiefenthaler Park, 2501 W. Galena St. Activities include a family-friendly basketball game with police, court-art, peacemaking arts and crafts, bouncy house, face painting, music, community resources, the Survive Alive House and free food! Sunday, June 17th, 2019. 12 p.m. -3 p.m. Chavez Dr. & National Ave. Ciclovia MKE returns for the fourth summer of open streets and healthy neighborhoods! Ciclovia MKE is a FREE public event that opens a route of car-free streets to bike, play, and exercise. Tuesday, June 19th 10 a.m. - 6 p.m. The 56th Annual Juneteenth Day Parade and Festival taking place on Tuesday, June 19. This year's parade steps off at 10:00 am from North 19th and West Atkinson Avenue and proceeding to Dr. Martin Luther King Jr. Drive. The Juneteenth Day Festival takes place from 10:00 a.m. to 6:00 p.m. on King Drive between Center and Burleigh Streets. The Festival features musical performances, numerous vendors from food to toys, along with community organizations sharing helpful resources for residents of all ages. Thursday, June 21st 4 p.m. - 6 p.m. 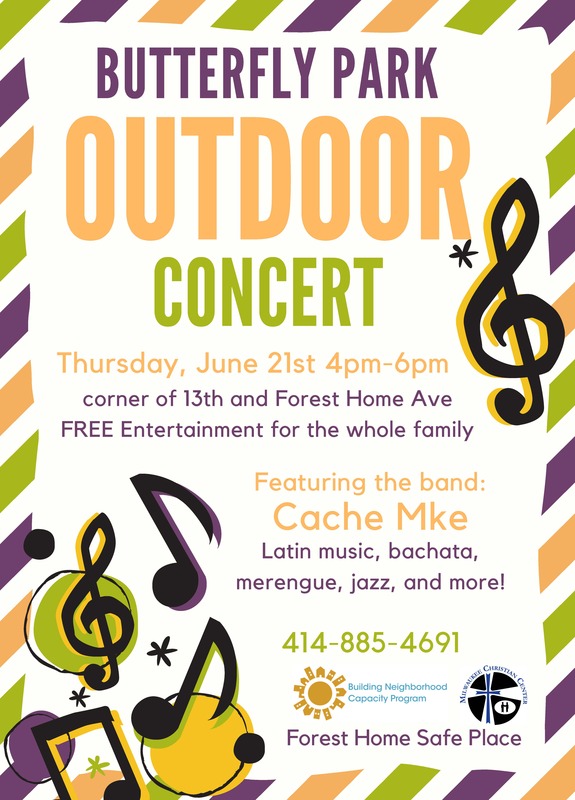 Corner of 13th & Forest Home Ave. Join your neighbors for a free concert as you dance to latin music, bachata, merengue, jazz, and more! Every Thursday from 3-6pm June 21 - September 13 Near West Side Partners (NWSP) will be hosting a farmers market at 20th & Kilbourn in Avenues West. NWSP is committed to bringing fresh food options to the 50,000+ residents and employees of the Near West Side neighborhoods. Third Thursdays of the month at 6:30pm. Mitchell Park 2400 W Pierce St. Join neighbors at Mitchell park for a fun time with live music. Free parking available. Bring a snack and drink and enjoy the show. 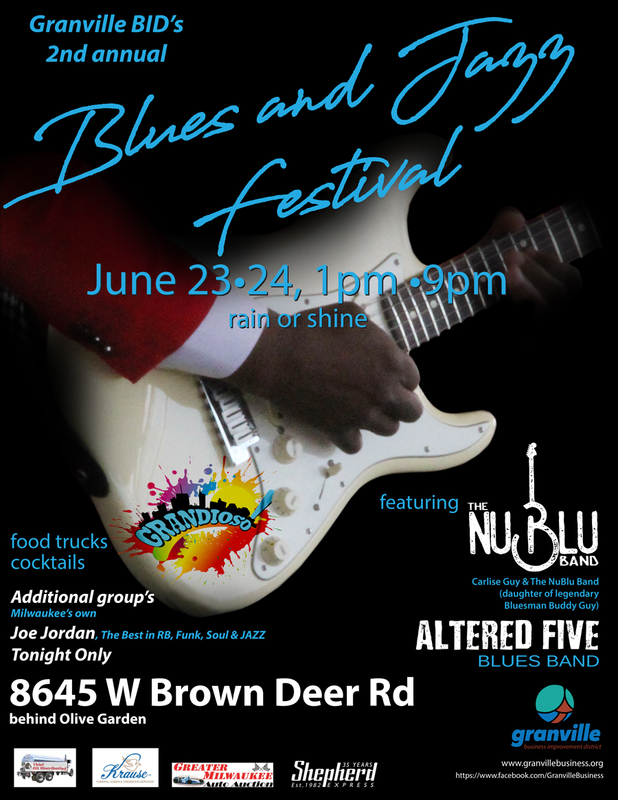 Saturday, June 23 - Sunday, June 24 1 p.m. - 9 p.m. 8645 W Brown Deer Rd. The Granville Blues & Jazz Festival, Grandioso, is the first and only celebration of Milwaukee’s diversity and Granville’s proud heritage. Grandioso is a music/food celebration expressed through blues, jazz, r&b and rock. All day long on both days there will be music, food, and drinks. Come and listen to the music, have lunch, snack or dinner and if the sounds move you dance!!!! Saturday, June 23 12 p.m. - 8 p.m. 2701 S Chase Ave. Celebrate with UMOS at their FunFest (Free Admission) for a day filled with music, food, kids activities and a resource fair. Menomonee Valley Partners and Potawatomi Hotel & Casino present Valley Week running from September 22 – 29. Explore and experience Milwaukee’s Menomonee Valley by participating in the week’s events, from a beer run, tours on land or in water, to dining al fresco at the Food Truck Festival, the week offers something to nature lovers, history enthusiasts, job seekers, and those looking for something unique to do. Plus $10,000 forgivable second mortgage loan! 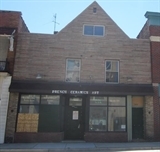 This commerical property in the Washington Park neighborhood could be yours! This 2,671 Sq. Ft building just needs a little love for full use. Some potential commerical uses include a resturant, catering, retail, office, business/food service, live/work unit, etc.